Schaumburg, IL – Productivity of production equipment is the key to profitability. Whether it is a steel mill, paper mill, mine or wind turbine, if it is not running, it is not making money. 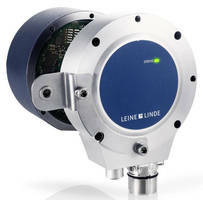 The Leine Linde model 800 rotary encoder is already a popular solution for measurement of speed and position in these demanding applications, and now an Advanced Diagnostics Upgrade (ADS) Unit is available for this encoder family. For more information on these encoders, contact Bob Setbacken at HEIDENHAIN at 805-562-1160, or e-mail at bsetbacken@heidenhain.com , or write to HEIDENHAIN Corporation, 333 E. State Parkway, Schaumburg, IL 60173. Leine Linde is based in Sweden with exclusive North American distribution through HEIDENHAIN Corporation in Schaumburg, IL. Leine & Linde is well known for offering high quality, heavy duty encoders of both the incremental and absolute type, are noted for their product robustness and design to cope with the harshest of environments, such as those with high vibration, dirt and cold temperatures. These heavy, severe duty encoders are suited for drive and measurement applications and are often found in industries such as pulp and paper, forest and wood processing, agriculture, aggregate and mining equipment.